You are currently browsing the tag archive for the ‘pacifism’ tag. ‘Peace on Earth’ is a Christmas cartoon, but a highly unusual one. With ‘Peace on Earth’ Hugh Harman daringly combines the world of cute animals to gloomy and surprisingly realistic images of war and devastation (which, incidentally have more in common with World War I than with World War II). ‘Peace on Earth’ is a surprisingly daring film for its time, with its clear pacifistic message and dark war imagery – no ordinary feat for a Hollywood cartoon! For today’s standards the animal scenes may be too saccharine, the staging too melodramatic, and the message too obvious, but the war images and the atmosphere of doom make ‘Peace on Earth’ a film that still impresses today. The short was rightfully nominated for an Academy Award. This gentle film is based on the children’s book ‘The Story of Ferdinand’ (1936) by Munro Leaf and Robert Lawson, and tells about Ferdinand, a gentle Spanish bull, who loves to sit quietly and smell the flowers. One day “five men with funny hats” come along, in search of suitable bull for a bullfight, and because the unfortunate Ferdinand has sat on a bee, his ferocious antics make him the one. However, once inside the arena, Ferdinand refuses to fight, much to the dismay of the matador. Ferdinand is a really peaceful, pacifistic character, and a remarkable persona in 1938, when war already was around the corner. This character must have been an inspirational one at the time, and the film won an Academy Award. 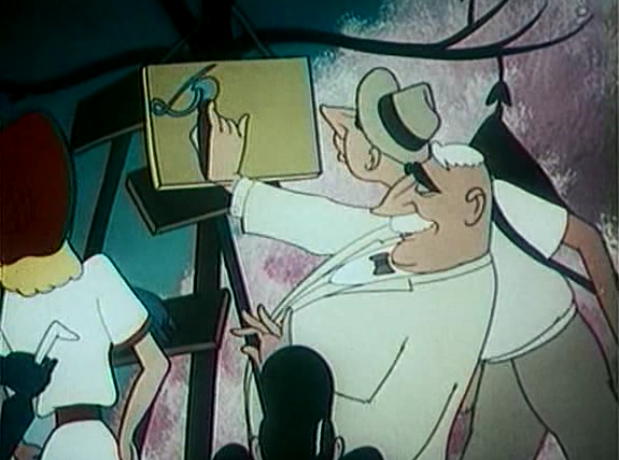 The short has a friendly atmosphere, and the only really funny part is the matador trying to persuade Ferdinand to fight by making faces, a scene animated with gusto by Ward Kimball. Yet, there’s room for some more fun, as the banderilleros and picadors are caricatures of Disney personnel, drawn by Ward Kimball. We watch Ham Luske, Jack Campbell, Fred Moore, Art Babbitt as banderilleros, Bill Tytla as the second of the picadores (the other two are probably caricatures, too, but I don’t know of whom), and Ward Kimball himself as the moza de espada, carrying the matador’s sword. All humans are animated very well, proof that after ‘Snow White and the Seven Dwarfs’, the animators were more confident with the human body than ever. Nevertheless, the human designs range from from very cartoony, like the Matador, to quite realistic, like the Spanish ladies, who all look like copies of Snow White. No wonder, as they were animated by Jack Campbell, who had been a key assistant to both the two units that animated the title heroine. ‘Ferdinand the Bull’ was the first Disney cartoon not to be part of any series. It could have been a Silly Symphony, as in 1938 that series had not ended, yet, but apparently, the studio chose the film to be no part of that. Perhaps, because in ‘Ferdinand the Bull’, music doesn’t play an important part, belying the series’ origin. Instead, the film uses a voice over to tell the tale, being the first Disney short to do so. The voice over technique is a rather lazy narrative device, but the Disney studio adopted it whole-heartedly. And so, unfortunately, voice overs would be deployed in many non-star Disney shorts and parts of package features of the 1940s and 1950s. In December 2017 Blue Sky released their feature length adaptation of ‘Ferdinand the Bull’. I haven’t seen this film, yet, and therefore cannot compare the two films. Can you?